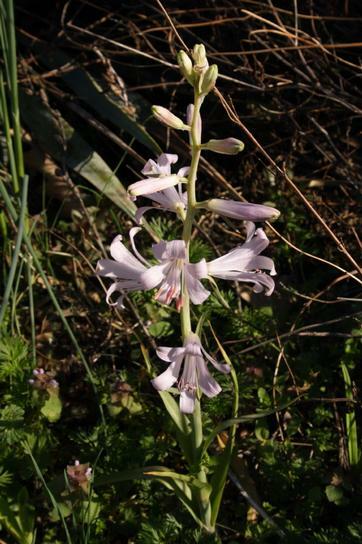 Notholirion is a genus with four (or six, according to some authorities) species in the Liliaceae family. The genus has sometime been placed in Lilium and sometimes in Fritillaria but nowadays is considered to be separate from both. All are native to the Himalayan region, found variously in Nepal, western China, northern Burma, Afghanistan, and other countries in the mountainous area. Most species grow in light woodland and are summer-growing. 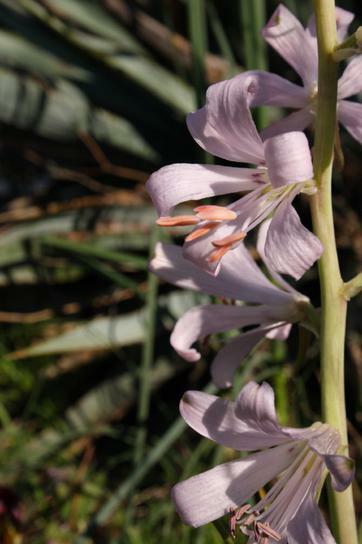 The bulb is monocarpic, like that of Cardiocrinum, dying after flowering. However, most species produce numerous bulblets which will flower in 3 to 4 years if well grown. The name derives from Greek notho (false) and lirion (lily). Notholirion bulbuliferum is a summer-growing species distributed from Nepal to western China in the Himalayas. The flowers are much smaller and less showy than those of N. thomsonianum and have little if any fragrance. This picture shows the plants growing in the wild in western China. Photograph by David Victor taken on Xiaosueshan, south of Zhongdian, Yunnan at 3200 metres in July 2005. 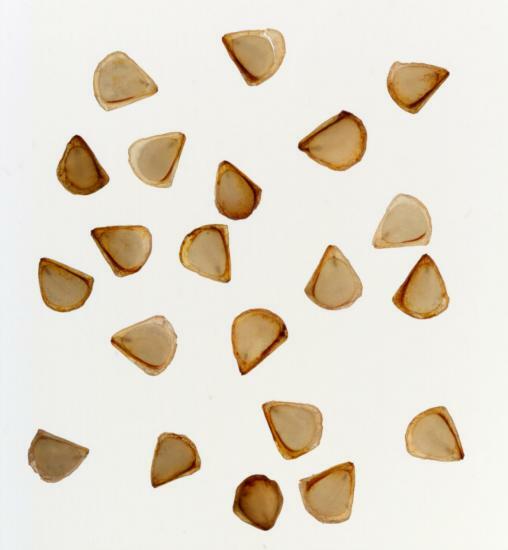 Seed photographs by David Pilling, the second taken with transmitted light shows the small embryos. 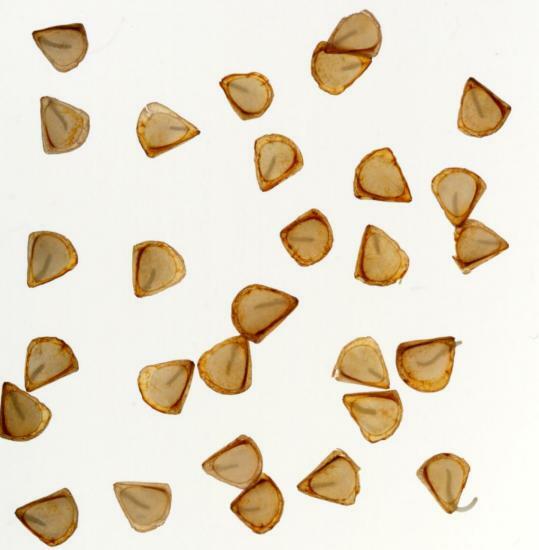 After the first two photos of dry seed were taken on the 10th January, the seed was split in two and placed in zip seal bags with a moist kitchen towel. Half were kept indoors (60-70 °F) and the remainder outside (32-40 °F). Photos 3 and 4 were taken using transmitted light on the 4th February. 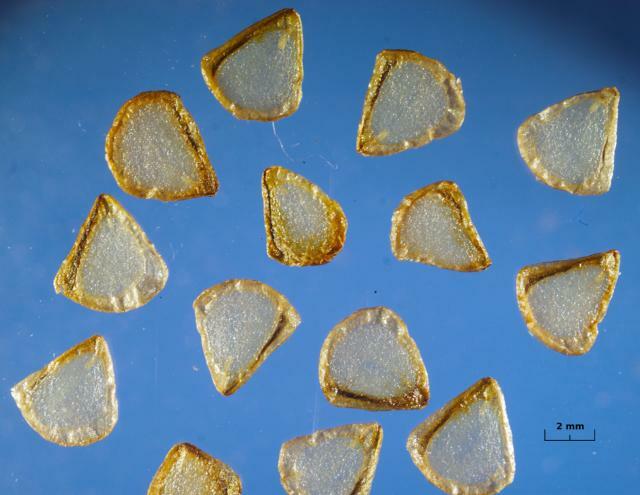 It can be see that whilst there has been little change in the seeds kept cold, the embryos in the warm seeds have grown and some are germinating. This behaviour is interesting when compared to Fritillaria (see Fritillaria Germination). The results reported here provoked some comment on the PBS list, some reported germination was difficult others said it was easy. 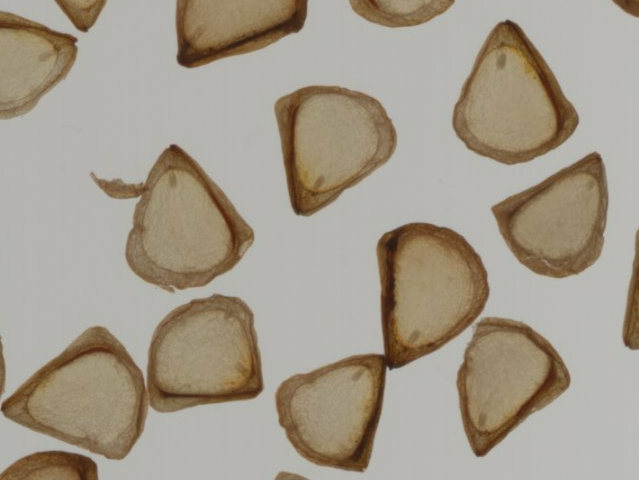 There is comment on the web that light is required for germination, so the ungerminated seeds that had been kept cold, were brought indoors and kept in the dark (light proof packet in a drawer), they germinated after around 30 days. Notholirion thomsonianum is a subalpine species from the rain-shadow part of the western Himalaya. 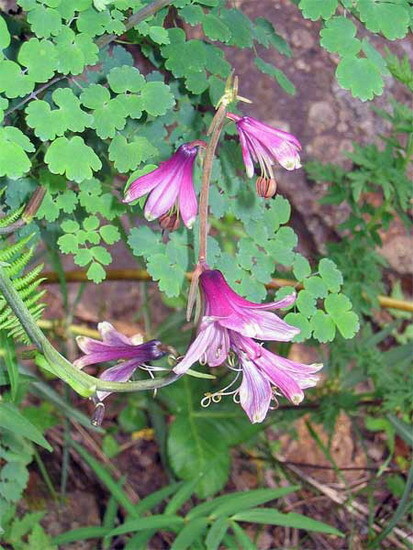 It has winter-growing foliage and flowers in late spring, then requires a dry (but not desiccating) summer dormancy. It withstands frost if covered against excessive winter rain. The flowers are lightly fragrant. First photo taken by Ian Bell in New Zealand. 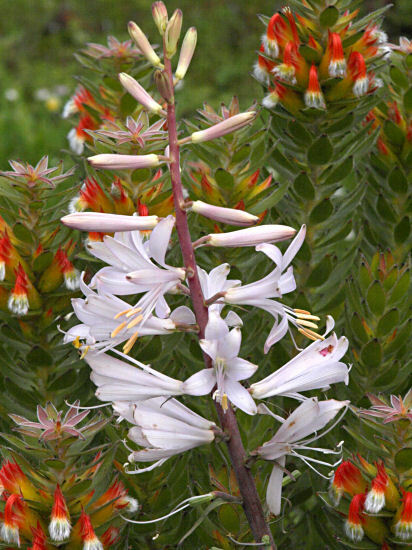 The plant in the background is Mimetes hirtus. The remaining photos are of plants from material provided by Jane McGary and taken by Jim McKenney in a zone 7 elevation 30 feet garden in Alexandria, Virginia on April 21, 2011.